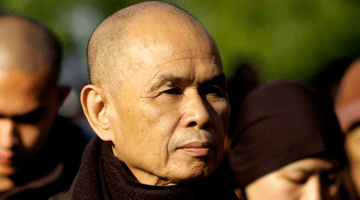 In these teaching on chapters one and twenty of the Lotus Sutra, Thich Nhat Hanh discusses the three dimensions in which all beings and things reside – the ultimate dimension, the historical dimension, and the dimension of action, represented here by the bodhisattva Never Disparaging. 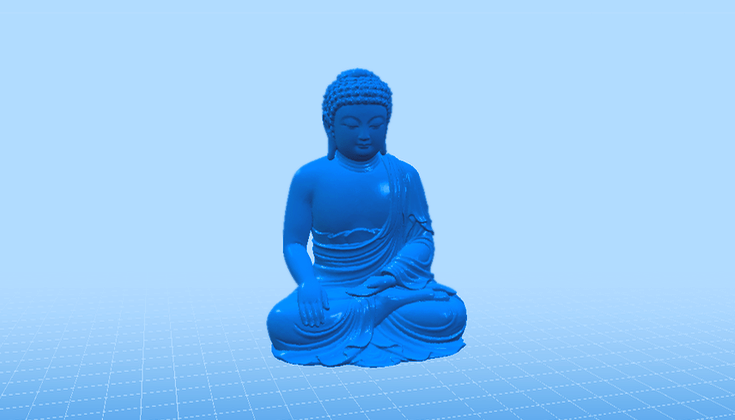 3D Model of Gautama Buddha, by Corey Upton. Chapter 1 of the Lotus Sutra takes us to Vulture Peak, near the city of Rajagriha in the kingdom of Magadha (present-day northeast India), where the Buddha has gathered with a large assembly of disciples, including Kashyapa, Shariputra, Maudgalyayana and Ananda, as well thousands of bhikshus and bhikshunis, including the Buddha’s aunt, Mahaprajapati and his former wife, Yashodhara. In addition, there are tens of thousands of great bodhisattvas in attendance, among them Manjushri, Avalokiteshvara, Bhaisajyaraja (Medicine King) and Maitreya. Also present are many thousands of gods, including Indra and the kings of the nagas, kinnaras, ghandharvas, asuras and garudas. The ruler of Magadha, King Ajatashatru, and his royal family and retinue are also in attendance. This vast multitude of many different kinds of beings is present in the assembly when the Buddha is about to deliver the Lotus Sutra. This not only sets the stage for the delivery of the sutra in the historical dimension, but also reveals the ultimate dimension. The vast numbers of shravakas and bodhisattvas, the presence of gods and mythical beings, give us our first taste of the ultimate dimension and show us that the opportunity to hear the Lotus Sutra delivered by the Buddha is something very special, a great occurrence not to be missed. First, the Buddha delivered a Mahayana sutra called the Sutra of Immeasurable Meaning, then entered a state of meditative concentration (samadhi). While he was in this concentration, heavenly flowers rained from the sky and the earth quaked. Then the Buddha sent out a ray of light from his ushnisha [crown protrusion on a buddha’s head, symbolizing the cosmic openness of an enlightened being], illuminating various cosmic realms. The entire assembly was able to see these worlds appear very clearly, and everyone was most surprised and delighted at the wonderful event that was taking place around them. In all these worlds, buddhas could be seen giving dharma talks to great assemblies of bhikshus, bhikshunis, upasakas and upasikas—exactly like the Buddha’s disciples in this world. In the ultimate dimension, never for a moment has the Buddha ceased to deliver the Lotus Sutra. In order to understand the great importance of this teaching, the assembly that had gathered in this historical dimension had to be introduced to the ultimate dimension. In the past, in another cosmic realm, the Buddha Sun and Moon Glow had also given the teaching of the Lotus Sutra. So the miraculous events that were happening that day were only a repetition of something that had already occurred in another dimension of reality—the ultimate dimension, which is unbounded by our ordinary perceptions of time and space. As far as the historical dimension is concerned, Shakyamuni was the buddha who was giving the dharma talk that day. 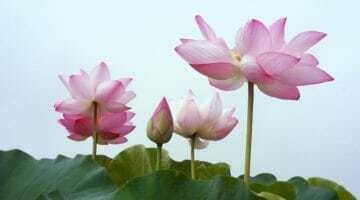 From this perspective, the Buddha gave teachings for forty years, and then only at the end of his life did he give the teaching of the Lotus Sutra. But in terms of the ultimate dimension, Buddha Shakyamuni and Buddha Sun and Moon Glow are one and the same. In the ultimate dimension, never for a moment has the Buddha ceased to deliver the Lotus Sutra. 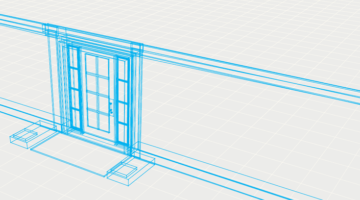 So, this opens two doors. The first door is that of history, the events we experience and what we can see and know in our own lifetimes. The second door is that of ultimate reality, which goes beyond time and space. Everything—all phenomena—participates in these two dimensions. When we look at a wave on the surface of the ocean, we can see the form of the wave and we locate the wave in space and time. Looking at a wave from the perspective of the historical dimension, it seems to have a beginning and an end, a birth and a death. A wave can be high or low, long or short—many qualities can be ascribed to the wave. The notions of “birth” and “death,” “high” or “low,” “beginning” and “ending,” “coming” and going,” “being” or “nonbeing”—all of these can be applied to a wave in the historical dimension. We, too, are subject to these notions. When we look from the historical dimension we see that we are subject to being and nonbeing. We are born but later on we will die. We have a beginning and an end. We have come from somewhere and we will go somewhere—that is the historical dimension. All of us belong to this dimension. Shakyamuni Buddha also has a historical dimension—he was a human being who was born in Kapilavastu and died in Kushinagara, and during his lifetime of eighty years he taught the dharma. At the same time, all beings and things also belong to the ultimate dimension, the dimension of reality that is not subject to notions of space and time, birth and death, coming and going. A wave is a wave, but at the same time it is water. The wave does not have to die in order to become water; it is already water right in the present moment. We don’t speak of water in terms of being or nonbeing, coming and going—water is always water. To talk about a wave, we need these notions: the wave arises and passes away; it comes from somewhere or has gone somewhere; the wave has a beginning and an end; it is high or low, more or less beautiful than other waves; the wave is subject to birth and death. But none of these distinctions can be applied to the wave in its ultimate dimension as water. In fact, you cannot separate the wave from its ultimate dimension. Even though we are used to seeing everything in terms of the historical dimension, we can touch the ultimate dimension. So our practice is to become like a wave—while living the life of a wave in the historical dimension, we realize that we are also water and live the life of water. That is the essence of the practice. Because if you know your true nature of no coming, no going, no being, no nonbeing, no birth, no death, then you will have no fear and can dwell in the ultimate dimension, nirvana, right here and now. You don’t have to die in order to reach nirvana. When you dwell in your true nature, you are already dwelling in nirvana. We have our historical dimension but we also have our ultimate dimension, just as the Buddha does. We also need to establish a third dimension of the Lotus Sutra to reveal its function, its action. How can we help people of the historical dimension get in touch with their ultimate nature so that they can live joyfully in peace and freedom? How can we help those who suffer to open the door of the ultimate dimension so that the suffering brought about by fear, despair and anxiety can be alleviated? I have gathered all of the chapters of the Lotus Sutra on the great bodhisattvas into this third, action dimension, the bodhisattva’s sphere of engaged practice. Practicing the path and liberating beings from suffering is the action of the bodhisattvas. The Lotus Sutra introduces us to a number of great bodhisattvas, such as Sadaparibhuta (Never Disparaging), Bhaisajyaraja (Medicine King), Gadgadasvara (Wonderful Sound), Avalokiteshvara (Hearer of the Sounds of the World) and Samantabhadra (Universally Worthy). The action taken up by these bodhisattvas is to help living beings in the historical dimension recognize that they are manifestations from the ground of the ultimate. Without this kind of revelation we cannot see our true nature. Following the bodhisattva path, we recognize the ground of our being, our essential nature, in the ultimate dimension of no birth and no death. This is the realm of nirvana—complete liberation, freedom, peace and joy. This is exactly the message of the Lotus Sutra—you are already a buddha in the ultimate dimension, and you can become a buddha in the historical dimension. In chapter 20 of the Lotus Sutra, we are introduced to a beautiful bodhisattva called Sadaparibhuta, “Never Disparaging.” The name of this bodhisattva can also be translated as “Never Despising.” This bodhisattva never underestimates living beings or doubts their capacity for buddhahood. His message is, “I know you possess buddhanature and you have the capacity to become a buddha,” and this is exactly the message of the Lotus Sutra—you are already a buddha in the ultimate dimension, and you can become a buddha in the historical dimension. Buddhanature, the nature of enlightenment and love, is already within you; all you need do is get in touch with it and manifest it. Never Disparaging Bodhisattva is there to remind us of the essence of our true nature. This bodhisattva removes the feelings of worthlessness and low self-esteem in people. “How can I become a buddha? How can I attain enlightenment? There is nothing in me except suffering, and I don’t know how to get free of my own suffering, much less help others. I am worthless.” Many people have these kinds of feelings, and they suffer more because of them. Never Disparaging Bodhisattva works to encourage and empower people who feel this way, to remind them that they too have buddhanature, they too are a wonder of life, and they too can achieve what a buddha achieves. This is a great message of hope and confidence. This is the practice of a bodhisattva in the action dimension. I do not hold you in contempt! And shall all become buddhas! Sadaparibhuta is very sincere and has great equanimity. He never gives up on us. The meaning of his life, the fruition of his practice, is to bring this message of confidence and hope to everyone. This is the action of this great bodhisattva. We have to learn and practice this action if we want to follow the path of the bodhisattvas. The sutra tells us that when Sadaparibhuta was near the end of his life he suddenly heard the voice of a buddha called King of Imposing Sound (Bhishmagarjitasvararaja) teaching the Lotus Sutra. He could not see that buddha but he clearly heard his voice delivering the sutra, and through the power of the teaching, Never Despising Bodhisattva suddenly found that his six sense organs were completely purified and he was no longer on the verge of death. Understanding deeply the message of the Lotus Sutra, he was able to touch his ultimate dimension and attain deathlessness. We can hear in the sound of the wind in the trees, or in the singing of the birds, the truth of the Lotus Sutra. We have already learned about the infinite life span of a buddha in the ultimate dimension. In terms of the historical dimension, a buddha may live one hundred years or a little bit more or less; but in terms of the ultimate dimension a buddha’s life span is limitless. Sadaparibhuta saw that his life span is infinite, just like the life span of a buddha. He saw that every leaf, every pebble, every flower, every cloud has an infinite life span also, because he was able to touch the ultimate dimension in everything. This is one of the essential aspects of the Lotus message. When his sense organs had been purified, he could see very deeply and understand how the six sense organs (eyes, ears, nose, tongue, body and mind) produce the six kinds of consciousness. When his senses had been purified he was capable of touching reality as it is, the ultimate dimension. There was no more confusion, no more delusion in his perception of things. This passage describes a kind of transformation that we too can experience. When the ground of our consciousness is prepared, when our sense consciousnesses and our mind consciousness have been purified through the practice of mindfulness and looking deeply into the ultimate nature of reality, we can hear in the sound of the wind in the trees, or in the singing of the birds, the truth of the Lotus Sutra. While lying on the grass or walking in meditation in the garden, we can get in touch with the truth of the dharma that is all around us all the time. We know that we are practicing the Lotus samadhi and our eyes, ears, nose, tongue, body and mind are automatically transformed and purified. Having realized the truth of the ultimate, Bodhisattva Sadaparibhuta continued to live for many millions of years, delivering his message of hope and confidence to countless beings. So we can see that the Lotus Sutra is a kind of medicine for long life. When we take this medicine, we are able to live a very long time in order to be able to preserve and transmit the teachings in the Lotus Sutra to many others. We know that our true nature is unborn and undying, so we no longer fear death. Just like Sadaparibhuta, we always dare to share the wonderful dharma with all living beings. And all those who thought the bodhisattva was only making fun of them finally began to understand. Looking at Sadaparibhuta they were able to see the result of his practice, and so they began to have faith in it and to get in touch with their own ultimate nature. This is the practice of this great bodhisattva—to regard others with a compassionate and wise gaze and hold up to them the insight of their ultimate nature, so that they can see themselves reflected there. These words are designed to wake us up. In modern society, psychotherapists report that many people suffer from low self-esteem. They feel that they are worthless and have nothing to offer, and many of them sink into depression and can no longer function well and take care of themselves or their families. Therapists, healers, caregivers, teachers, religious leaders and those who are close to someone who suffers in this way all have the duty to help them see their true nature more clearly so that they can free themselves from the delusion that they are worthless. If we know friends or family members who see themselves as worthless, powerless and incapable of doing anything good or meaningful, and this negative self-image has taken away all their happiness, we have to try to help our friend, our sister or brother, our parent, spouse or partner remove this complex. This is the action of Never Disparaging Bodhisattva. We have to practice just like Never Disparaging Bodhisattva, who did not give up on people or lose patience with them, but always continued to hold up to others a mirror of their true buddhanature. We also have to practice so as not to add to others’ feelings of worthlessness. In our daily life, when we become impatient or irritated, we might say things that are harsh, judgmental and critical, especially in regard to our children. When they are under a great deal of pressure, working very hard to support and care for their family, parents frequently make the mistake of uttering unkind, punitive or blaming words in moments of stress or irritation. The ground of a child’s consciousness is still very young, still very fresh, so when we sow such negative seeds in our children we are destroying their capacity to be happy. So parents and teachers, siblings and friends all have to be very careful and practice mindfulness in order to avoid sowing negative seeds in the minds of our children, family members, friends and students. When our students or loved ones have feelings of low self-esteem, we have to find a way to help them transform those feelings so that they can live with greater freedom, peace and joy. We have to practice just like Never Disparaging Bodhisattva, who did not give up on people or lose patience with them, but always continued to hold up to others a mirror of their true buddhanature. I always try to practice this kind of action. One day there were two young brothers who came to spend the day with me. I took them both to see a new manual printing press I had just gotten. The younger boy was very interested in the machine and while he was playing with it the motor burned out. As I was pressing one button to show the boys how it worked, the little boy pressed another at the same time and it overstressed the machine’s engine. The elder brother said angrily, “Thây, you just wanted to show us the machine. Why did he have to do that? He wrecks whatever he touches.” These were very harsh words from such a young boy. Perhaps hearing his parents or other family members use blaming language like this had influenced him and he was just repeating what he had heard without realizing the effect it would have on his little brother. In order to help mitigate the possible effects of this criticism on the younger boy, I showed the boys another machine, a paper cutting machine, and this time I instructed the younger one on how to use it. His brother warned me, “Thây, don’t let him touch it, he’ll destroy this one too.” Seeing that this was a moment when I could help both boys, I said to the older brother, “Don’t worry, I have faith in him. He is intelligent. We shouldn’t think otherwise.” Then I said to the younger boy, “Here, this is how it works—just push this button. Once you have released this button, then you press that button. Do this very carefully and the machine will work properly.” The younger brother followed my instructions and operated the machine without harming it. He was very happy, and so was his older brother. And I was happy along with them. Following the example of Sadaparibhuta Bodhisattva, I only needed three or four minutes to remove the complex of the younger brother and teach the older brother to learn to trust in the best of his younger brother and not just see him in terms of his mistakes. In truth, at that moment I was a bit concerned that the young boy would ruin the other machine. But if I had hesitated and not allowed him to try and follow my instructions, believing that he would destroy the machine, I could well have destroyed that little boy. Preserving the health and well-being of the mind of a child is much more important than preserving a machine. You only need to have faith in the action of Sadaparibhuta and very quickly you can help others overcome their negative self-image. Never Despising Bodhisattva shows everyone that they have the capacity for perfection within themselves, the capacity to become a buddha, a fully enlightened one. The message of the Lotus Sutra is that everyone can and will become a buddha. Sadaparibhuta is the ambassador of the Buddha and of the Lotus Sutra, and sometimes ambassadors are reviled or attacked. Sadaparibhuta was also treated this way. He brought his message to everyone, but not everyone was happy to hear it because they could not believe in their own buddhanature. So when they heard his message they felt they were being scorned or mocked. “Throughout the passage of many years, he was constantly subjected to abuse . . . some in the multitude would beat him with sticks and staves, with tiles and stones.” The mission of a dharma teacher, of a bodhisattva, requires a great deal of love, equanimity and inclusiveness. “Yes, I think so, my Lord,” replied Purna. So Purna went to that land and he was able to gather a lay sangha of five hundred people practicing the mindfulness trainings, and also to establish a monastic community of around five hundred practitioners. He was successful in his attempt to teach and transform the violent ways of the people in that country. Purna exemplifies the practice of kshanti, or inclusiveness. Sadaparibhuta may have been a future or a former life of Purna. We are the same. If we know how to practice inclusiveness, then we will also be the future life of this great bodhisattva. We know that Sadaparibhuta’s life span is infinite, and so we can be in touch with his action and aspiration at any moment. And when we follow the practice of inclusiveness of Never Despising Bodhisattva, he is reborn in us right in that very moment. We get in touch with the great faith and insight that everyone is a buddha, the insight that is the very marrow of the Lotus Sutra. Then we can take up the career of the bodhisattva, carrying within our heart the deep confidence we have gained from this insight and sharing that confidence and insight with others. Therapists and others in the healing professions, dharma teachers, school teachers, parents, family members, colleagues and friends can all learn to practice like Sadaparibhuta. Following the path of faith, confidence and inclusiveness, we can help free many people from the suffering of negative self-image, help them recognize their true buddhanature, and lead them into the ultimate dimension.